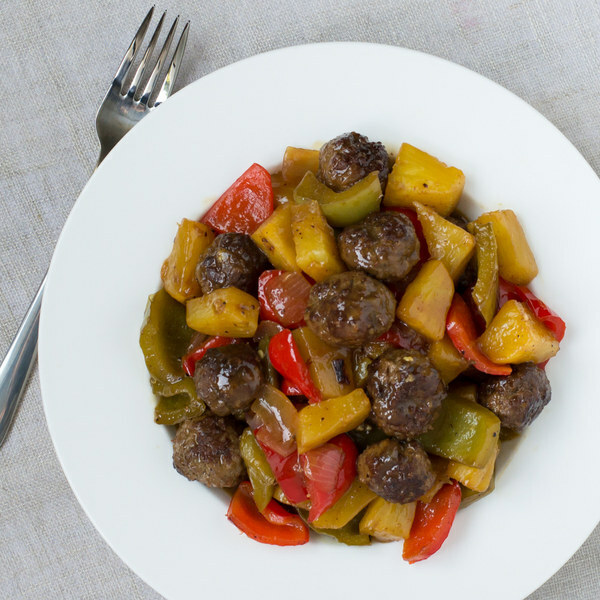 ← Sweet & Sour Meatballs with Pineapple & Bell Pepper. In a medium bowl, combine beef, bread crumbs, salt, and pepper. Mix well. Peel and medium dice onion. Wash, seed, and medium dice bell peppers. Cut off skin from pineapple, core, and cut into bite-sized pieces. Form beef mixture into small meatballs and place on a plate. Coat bottom of skillet with oil. Add meatballs and, turning often, cook until browned on all sides, 3-4 minutes. Transfer to a plate. In a medium bowl, prepare sauce by whisking together broth, vinegar, honey, soy sauce, and cornstarch. Return skillet to stove and add more oil. Add onion and bell peppers. Stirring frequently, cook until tender-crisp, 2-3 minutes. Stir in pineapple and cook for about 1 minute. Pour in sauce and return meatballs to skillet. Season with salt and pepper. Stir to combine and cook until sauce is thickened, 3-4 minutes. To serve, place in a bowl. Enjoy!